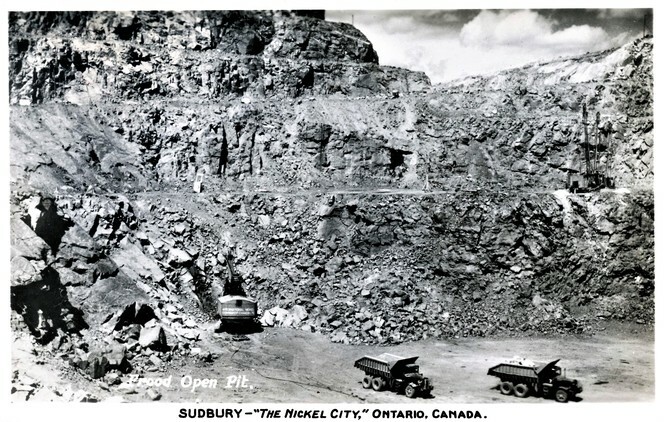 View of the Sudbury nickel mining area, in 1948. View of the Sudbury nickel mining area, ca. 1955. 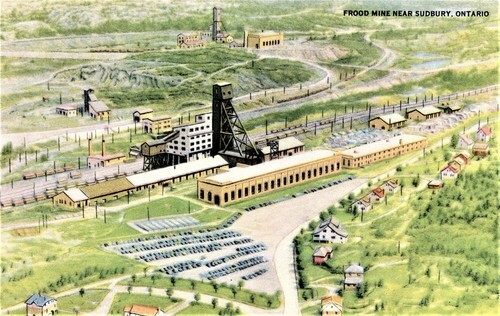 Aerial view of the Sudbury nickel mining area, in 1960. A nickel mine in the Sudbury nickel irruptive. Reference: Hawley, J.E. & Stanton, R.L. 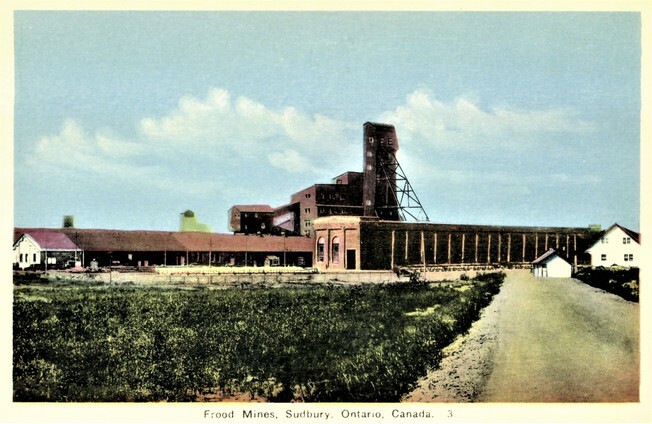 (1962): The Sudbury ores: their mineralogy and origin. Part II. The facts: The ores, their minerals, metals and distribution, Canadian Mineralogist 7, 30-145. Reference: Bull. Soc. Franç. 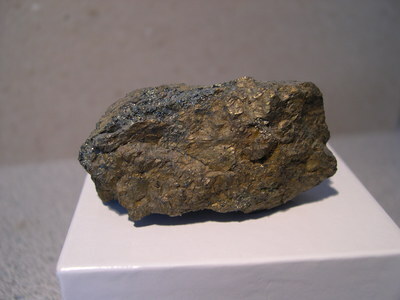 Minéralo. Cristallo. , 1974, 97, pp. 511. Reference: SCHOLZ, D.L. (1937): The magmatic nickeliferous ore deposits of East Griqualand and Pondoland I. Transactions of the Geological Society of South Africa 39, 83-212. MICHENER, C.E. (1940): Minerals Associated with Large Sulphide Bodies of the Sudbury Type. Ph.D. thesis, University of Toronto, Toronto, Ontario. MICHENER, C.E. & PEACOCK, M.A. (1943): Parkerite (Ni3Bi2S2) from Sudbury, Ontario: redefinition of the species. American Mineralogist 28, 343-355. FLEET, M.E. (1973): The crystal structure of parkerite (Ni3Bi2S2). American Mineralogist 58, 435-439. PETRUK, W., HARRIS, D.C. & STEWART, J.M. (1969): Langisite, a new mineral, and the rare minerals cobalt pentlandite, siegenite, parkerite and bravoite from the Langis mine, Cobalt-Gowganda area, Ontario. Canadian Mineralogist 9, 610-612. Reference: Ramdohr, Paul, 1969, The Ore Minerals and their Intergrowths, Pergamon Press, p. 384. MICHENER, C.E. (1940): Minerals Associated with Large Sulphide Bodies of the Sudbury Type. Ph.D. thesis, University of Toronto, Toronto, Ontario. MICHENER, C.E. & PEACOCK, M.A. (1943): Parkerite (Ni3Bi2S2) from Sudbury, Ontario: redefinition of the species. American Mineralogist 28, 343-355. FLEET, M.E. (1973): The crystal structure of parkerite (Ni3Bi2S2). American Mineralogist 58, 435-439. PETRUK, W., HARRIS, D.C. & STEWART, J.M. (1969): Langisite, a new mineral, and the rare minerals cobalt pentlandite, siegenite, parkerite and bravoite from the Langis mine, Cobalt-Gowganda area, Ontario. Canadian Mineralogist 9, 610-612. HAWLEY, J.E. & BERRY, L.G. 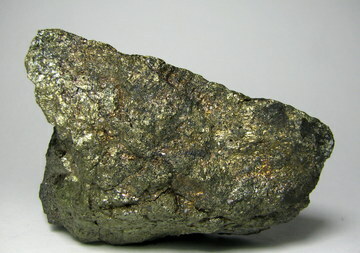 (1958): Michenerite and froodite, palladium bismuth minerals. Canadian Mineralogist 6, 200-209. Hawley, J.E. 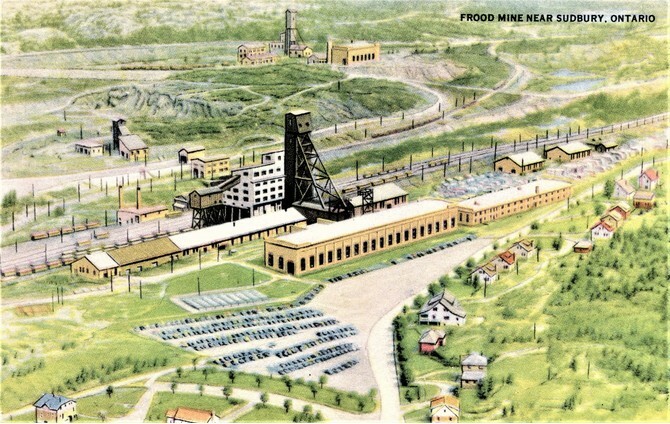 (1965) Upside-down zoning at Frood, Sudbury, Ontario. Economic Geology: 60: 529-575. Fleet, M.E. (1977) Origin of disseminated copper-nickel sulfide ore at Frood, Sudbury, Ontario. Economic Geology: 72: 1449-1456.